Collecting old Communist Block weapons is one of my passions, and this often means a lot of cleaning. Many old SKSes, SVTs, and Mosins were bought very inexpensively and used as plinkers and hunting rifles and never properly maintained. Many came dirty or packed with cosmoline from the arsenals. So dealing with bores that require hundreds of patches to clean is a routine operation for me, so I decided to put together this note on effective cleaning procedures. Centerfire target rifles should be cleaned every 70-100 rounds when using modern ammunition, more if the bullets are treated with molybdenum powder. Quite often (always for treated bullets) the rifle reaches its prime accuracy only after the first 20-30 rounds have been fired through it. There are many internet rumors about "breaking the barrel" by cleaning after every 5 rounds. I have never seen a benchrest barrel maker make this recommendation. On the other hand, I've seen many pointing out that rifles are often ruined by cleaning, not shooting. However, rifles should be cleaned immediately after shooting surplus ammunition. Note that some sellers often advertise surplus ammunition as "clean", "mildly corrosive", or "not corrosive". Unless it was made in the US after 1980 it is much safer to presume that corrosive primers are used, and clean it after every visit to a range. Centerfire hunting rifles should be cleaned after every shooting session. For a target rifle, the most important accuracy measure is a group size. For a hunting rifle, it is the point of impact. Point of impact is affected by the carbon and copper coating of the bore, and so cleaning rifle after shooting it ensures consistency when the rifle is fired at the game. I usually clean my centerfire pistols every 2-3 shooting sessions, or every 200-300 rounds. Rimfire rifles and pistols should be cleaned infrequently. 22LR round is slow and leaves no metal fouling in the barrel. The carbon fouling gets wiped by the subsequent round. Once every 500-1000 rounds is enough, and just swiping the barrel one or twice is sufficient. Overachieving here is not a virtue, as cleaning might remove more of a barrel material than shooting. We do not want that. All firearms should be cleaned from the breach - never from the muzzle. If cleaned from the muzzle, the cleaning rod will damage the rifling at the place where it affects accuracy the most. When cleaning, make sure that the contact between the rod and the rifling is minimized, especially at the muzzle. For instance, when using the brush, do not push the brush all the way out before changing the direction of the stroke. 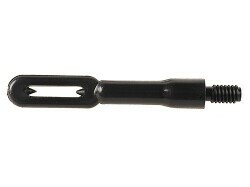 Always use one-piece coated cleaning rod and a bore guide (see below). After cleaning, wipe the cleaning agent with clean patch and apply lubricating agent. Bore can be soaked in it, but exterior pieces that come into contact with the wood should be first lubricated and then wiped out clean. Lubricating agents tend to penetrate the wood and soften it. This eventually leads to poor contact between the stock and the action and the loss of accuracy. Wiping the lubricant off wood still leaves a microfilm of coating, but not enough to damage the wood. If the rifle is stored for a long time, use gun grease (see below) instead of your normal lubricant in the bore. 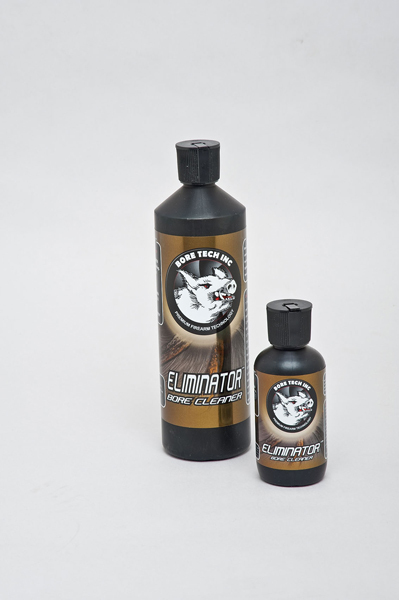 Lubricants evaporate in a year or two; gun grease offers long term protection. Before shooting always wipe the bore clean with a couple of fresh patches. Hoppe's 9 is probably the most popular cleaning agent in the US and is sold everywhere. However, the most effective (in terms of number of patches pushed through the bore before it becomes clean) cleaning agents for centerfire rifles in my experience are made by Bore Tech. The difference between Bore Tech and Hoppe's 9 on the dirtiest Mosins is 3-4 times more patches when using the later. 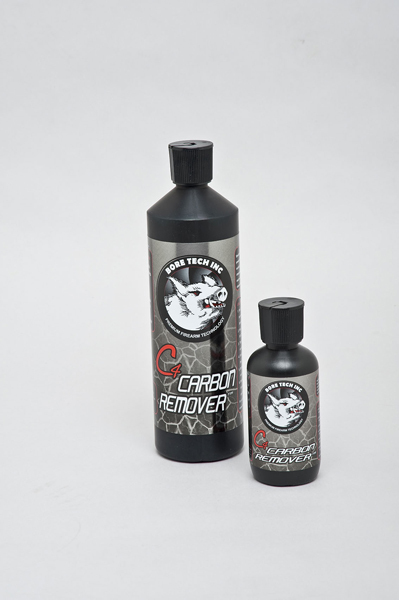 I use Bore Tech C4 Remover first to clean out carbon fouling, then Eliminator to take copper fouling out. Corrosive ammunition have primers that deposit hygroscopic salts in the barrel. The salts then absorb the water and the resulting brine does all the damage. The salts are not soluble in typical oil-based cleaners, which is why a water-based solution to dissolve them needs to be applied first. 10 patches soaked in Windex followed by drying and then the normal cleaning routine work very well. Occasionally you will get a firearm with some amount of rust in the bore. This needs to be cleaned out immediatly because rust patches deepen and cause pitting in the barrel. When left untreated the pitting can become so deep that it will start stripping copper shell from the bullet causing serious loss of accuracy. I use Flitz polish - it removes rust without removing metal from the barrel, and it does it pretty quickly. For rimfire cleaning agent I do not have a particular preference. 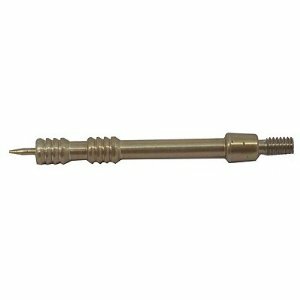 I tried the Bore Tech rimfire blend, but it does not seem to remove any more dirt than just a few swabs of Break Free CLP (below); so I usually do just that - clean rimfire barrels by 2-3 swabs of Break Free. I clean centerfire pistols using the same procedure as I use for centerfire rifles - except the bores typically clean much faster. For lubrication Break-Free CLP works well. I am no chemical engineer, but the internet reports (from other non-chemical engineers) are very positive. I can testify to its amazing fluidity - it gets into every nook and cranny very easily. I literally buy it by the gallon - from a guy who sells it on http://forums.gunboards.com for $30/gallon (as of this writing). Most of the firearms in my collection are never shot - they are collector items. Since CLP evaporates in about a year, I needed to either reapply it regularly, or come up with a more durable solution. So I use Hoppe's Gun Grease. It is durable, does not evaporate, and it coats metal very well. I could not find any research as to effect of either Break-Free CLP or Hoppe's gun grease on wood, so be careful and avoid contact between these agents and your stock. I prefer cotton patches. They have a nice property - loose threads can usually be removed from two sides by just pulling on them. This leads to a thinner patch - useful when you want it to lubricate rather than push the dirt out. Bore Tech and Pro Shot brands work very well. Avoid nylon patches that are often sold by weight on gun shows. They do not soak lubricant well, they are much less pliable, and it takes scissors to make them smaller. 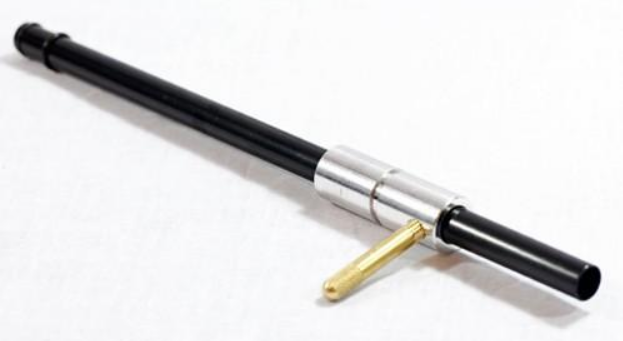 A one-piece rod should always be used for cleaning the bore, stainless steel or plastic coated, or carbon fiber. The aluminum segment rods that come with inexpensive cleaning kits absorb the pieces of metal from the remnants of bullet and brass and act as an abrasive surface eroding the bore as you clean it. It also bends more easily, which means more pressure - and more abrasive action - gets applied to parts of the rifling, muzzle, or throat. The best rods are made by Dewey. They have durable coverage and are for all practical purposes indestructible. Their rods are caliber-specific, but the threading on most centerfire rods is the same, and a lot of calibers overlap. A good place to find Dewey rods in Seattle area is Adventure Sports in Lynnwood. Long, thin rods are often expensive to ship, so a local purchase can be practical. Expect to pay around $30 for a good rod. A 17HMR, a 22 caliber centerfire, and 30 caliber centerfire 36" rods would more or less cover the whole range. You will also need a bore guide. Bore guide serves two purposes. It centers the rod so it does not wear out the leade (the beginning of the rifling on the breach side), and it also seals the chamber so the cleaning fluids do not escape into the action. 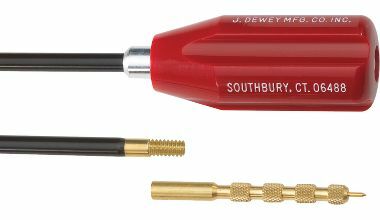 Dewey makes the best by far, and price-wise ($25) they are not too different from the alternatives. Unfortunately, rimfire bore guides are hard to obtain, because they are not interchangeable. Brownell has a number of gun-specific boreguides. I bought a couple and tried them on, but they did not fit any of my rimfire rifles. You need jags, brushes, and patch pullers. Bore Tech Eliminator colors the patch blue as it dissolves copper fouling in the barrel. Unfortunately, brass jag colors it as well, so you need to make sure that your cleaning implements are not brass. It is fairly easy to find a synthetic brush with aluminum base and plastic patch puller. Plastic jag is a fairly decent solution, but they exist only in very few calibers. An alternative - and a fairly expensive one, but worth it - is Bore Tech "Proof Positive" jags. They can be found in most popular online stores such as Grafs and MidwayUsa. When you are buying jags, always buy one caliber below the bore caliber. Jags that match the caliber of the rifle fit too tight and the solvent tends to be squeezed out instead of lubricating the bore. Conversely, when buying a brush (always, ALWAYS a nylon one!) buy it in one caliber above - this would ensure a longer life for the brush as well as better cleaning action. For instance, buy a .243/6mm brush for 22 caliber centerfire gun, a 30 caliber for 6.5/7mm bore, and .338 brush for 30 caliber rifle. 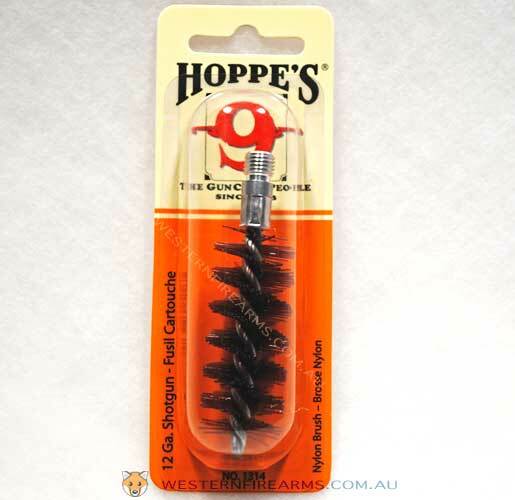 There is one exception - a 22 rimfire brush will not fit in a 17HMR bore. A gun rest is a must have to hold your firearm securely in place as you push patches through the bore. Cabelas sells several specialized cleaning vises. I use an older shooting rest for the same purpose. Once in a while you will have to disassemble your firearm to clean and lubricate parts (such as underside of the stock or the trigger group) that are not accessible otherwise. It always pays to take a newly acquired gun apart to make sure that there are no hidden problems. I strongly recommend buying a gunsmith scredriver set. The best one is made by Wheeler Engineering. The cheaper options that are smaller and can fit into a shooting bag can also be adequate, and can be had for less than $10. The difference between a gunsmith screwdriver and a regular one is that the regular screwdriver has a tapered blade. 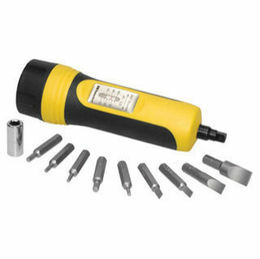 A gunsmith screwdriver's blade is flat, and provides the contact with the full depth of the slot. This avoids damaging the slot on a screw that is quite often very expensive, and sometimes downright impossible to replace. When replacing the stock you will find that torquing it to a particular measure could be essential to accuracy. It is especially true for wood stocks. I found that I could improve accuracy of my Kimber twofold by just playing with the torque on its action screws. Setting the maximum torque on smaller screws - for instance, the ones that hold the scop bases - makes avoiding stripping threads easy. Wheeler Engineering makes a (relatively) inexpensive torque wrench ($35). Coupled with bits from a gunsmith screwdriver set it makes almost any disassembly easy and safe. Disassembly of many rifles and pistols sometimes requires driving out pins. A set of brass punches combined with a brass hammer is a worthy investment, and is almost always required to take apart bolts. Brass does not mar steel, so a misplaced blow will not leave a permanent mark on your gun. 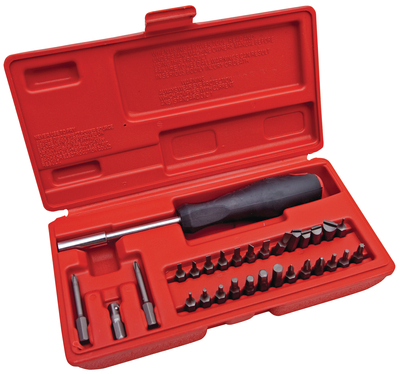 Grafs makes and sells a set of hammer and punches for about $20. If you buy a lot of used or surplus firearms, a boroscope is an essential tool to have. It allows one to inspect the real condition of your rifles' bores. Quite often a bore that looks bright and shiny to a naked eye turns out to be worn and badly corroded when examined through a boroscope. Conversely, a dark bore that looks corroded at the first sight can be just packed with carbon fouling - a condition that is clearly visible through a boroscope as well. Do not forget our store! There are a number of cheaper alternatives, but the Hawkeye boroscope is the only one that is really worth having. The cheap boroscopes are built from a collection of fiberoptic strands packed together. The picture that they transmit has a grainy, pixelated quality as one fiber transmits one "pixel" of the image. There are oftne only 100-200 optic strands, so the picture's resolution leaves a lot to desire. Hawkeye boroscopes are made of a single glass tube and the image that they transfer does not have a resolution limit of a bunch of optic fibers. It is very nice and clear - but comes at a price. These instruments retail for just under $1000. Read a more detailed review here: http://www.6mmbr.com/hawkeyeborescope.html. Guns are some of the most durable goods there are, as a well-maintained firearm can give literally decades of trouble-free service. I hope this article can help you take good care of yours.